29 May 2017. The information technology industry is a growing presence in health care, both financially and qualitatively, according to a new report. Tech industry market research company CB Insights released its assessment to subscribers on 22 May. CB Insights says tech industry investments about tripled in 2016 compared to 2015, to nearly $2.8 billion in 41 separate deals. So far in 2017, says the company, the tech industry invested some $1.5 billion in 18 deals, more than half of the 2016 dollar total and on track to exceed $4 billion by the end of the year. – Alphabet, the parent company of Google, founded Verily Life Sciences, which in the past year concluded joint-venture deals with Sanofi on diabetes management and GlaxoSmithKline on miniaturized electronic therapeutics. Alphabet’s venture capital division also in the past year made investment deals in biotechnology companies developing therapeutics, including stem cell transplantations, treatments for infectious diseases, and cancer immunotherapies. – General Electric is a tech company with a major presence in health care. GE is a long-time maker of medical devices, with more recent deals in data analytics from electronic medical records and monitors to alert for adverse health events. The company’s venture capital division in 2016 also made a $220 million investment in genomics and analytics enterprise Human Longevity Inc.
– Amazon Web Services is a leading provider of database services for health care analytics, including genomics, but in March of this year, joined other venture financiers in funding GRAIL Inc., a cancer diagnostics company. In addition, the business television network CNBC reported earlier this month that Amazon began hiring executives to formulate a strategy for entering the pharmaceutical business. 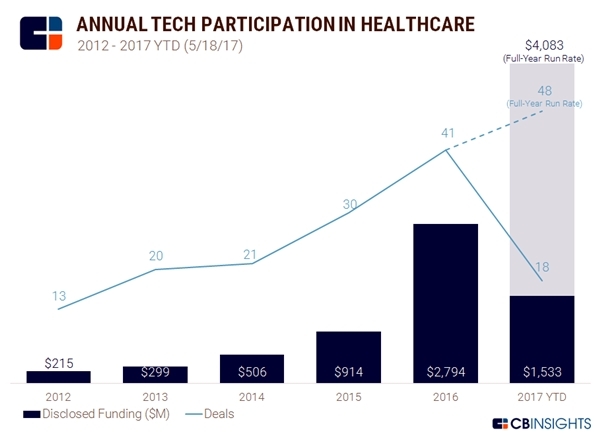 – Intel Corporation, says CB Insights, largely relies on its venture capital division to invest in health care and life science start-ups. As reported in Science & Enterprise, however, Intel is partnering with the Broad Institute at Harvard and MIT to produce software that speeds and streamlines analysis of genomic sequencing variations, which the partners are releasing into open-source. In addition, NIH hired the head of Intel’s life science and health care group to lead the agency’s All of Us program on precision medicine.